Without Children: You or your spouse must have lived in Utah for 3 months before filing for divorce. With Children: If there are minor children, you or your spouse must have lived in Utah with the children for 6 months before filing for divorce. The no-fault ground for divorce in Utah is irreconcilable differences. You review, sign, and file the initial divorce documents. Provide your spouse with the divorce documents he/she needs to sign. DivorceWriter provides forms specific to the Utah and offers a money back guarantee if your documents are not accepted by the Court. 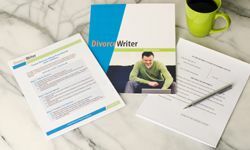 You have qualified to use DivorceWriter to complete your Utah divorce papers online. Select "Continue" to start the interview.